The Defender® Plastic Narrow Bird Spikes 6 Metre Pack With Glue contains everything needed for the property owner to protect ledges from landing and perching pigeons and other like sized birds. For narrow ledges and window sills, the Defender® Plastic Narrow Bird Spike is ideal for protecting ledges with a depth of up to 100 mm. Pigeons landing on window sills and narrow ledges can create unsightly mess, but this Defender® Plastic Spikes Pack will ensure your property looks clean and is pigeon free from the moment it is installed. The only additional tool needed is a caulking gun for the included Defender® Silicone. All our Defender® retail packs are designed, manufactured, supplied and despatched by us, Jones and Son Pest Control Supplies in Devon. We love customers visiting our warehouse to see how the plastic spikes packs are made and to get advice from our team on how to solve your pigeon problem. If your bird proofing job requires 60 strips (20 metres) or more of narrow plastic spikes, take a look at the Defender® Narrow Pigeon Spikes page where larger amounts can be purchased. 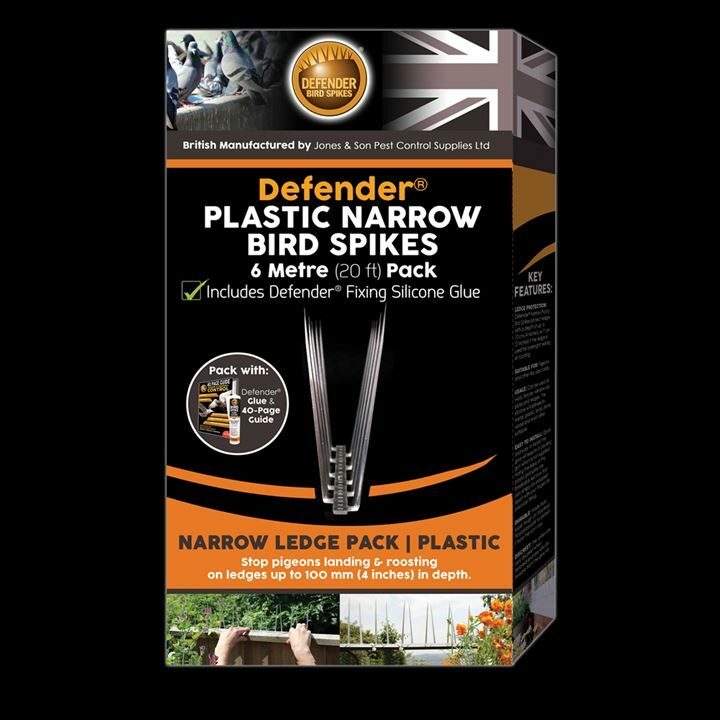 Defender® Plastic Narrow Bird Spikes protect ledges with a depth of up to 100 mm (4 inches) or 75 mm (3 inches) if the ledge is used for overnight nesting or roosting. Pigeons and other like sized birds. Quick and easy to install, the glue will require a caulking gun which is not supplied. For a simple guide to installation, please click here Defender® Plastic Narrow Bird Spikes - Installation Guide. 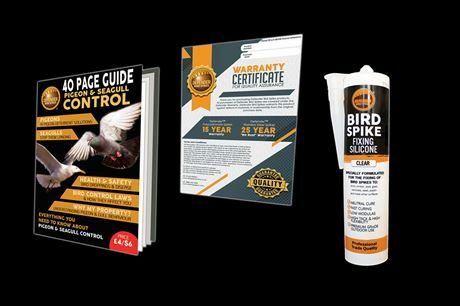 However, there is a perfect little installation guide on how to correctly install our Plastic Spike Bird Deterrents on the actual pack itself and within the informative Pigeon Guide which is included. Can be used on walls, fences, window sills, pipes and ledges. The silicone will adhere to metal, plastic, brick, stone, wood and most other surfaces. Along the base of the bird spike are breakable sections that can simply be snapped apart with your fingers for precision fitting. 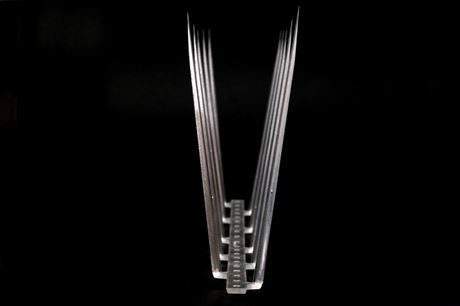 The spikes are very discreet when installed and are virtually invisible form the ground. 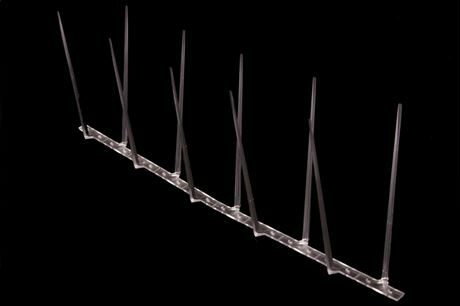 If the ledge is wider than 100 mm you could install 2 or more rows however, please consider using our Defender® Plastic Wide Bird Spikes 3 Metre Pack. If you have a question about the Defender® Plastic Narrow Bird Spike Pack, please contact us and we will help you move pigeons off your property!